I am always careful about the movies my boys are exposed to. I want to make sure what they are watching is family-friendly. So when the new Angry Birds the Movie came out I knew that I could be comfortable with my boys watching it. 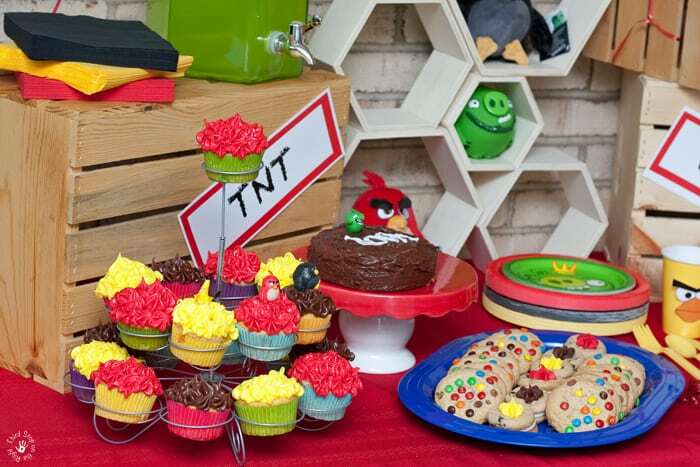 In fact, they like the movie so much that we decided to throw an Angry Birds viewing party. I always love themed parties and this one was no different. 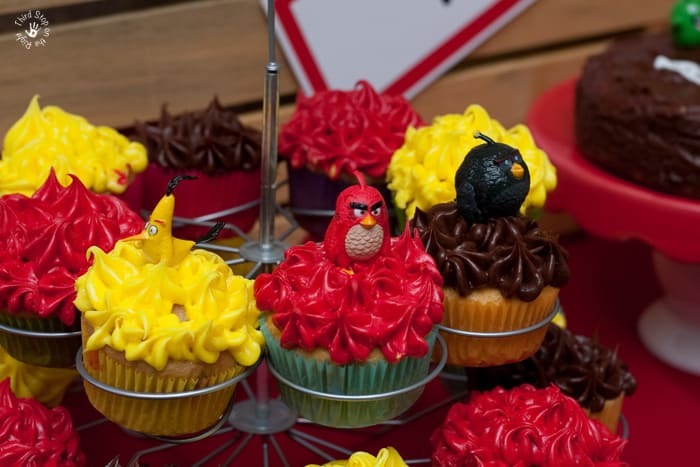 I was inspired not only by the different colors of the Angry Birds characters but also by the characters themselves. I began by creating a wall similar to the kind the birds had to break through on Piggy Island. 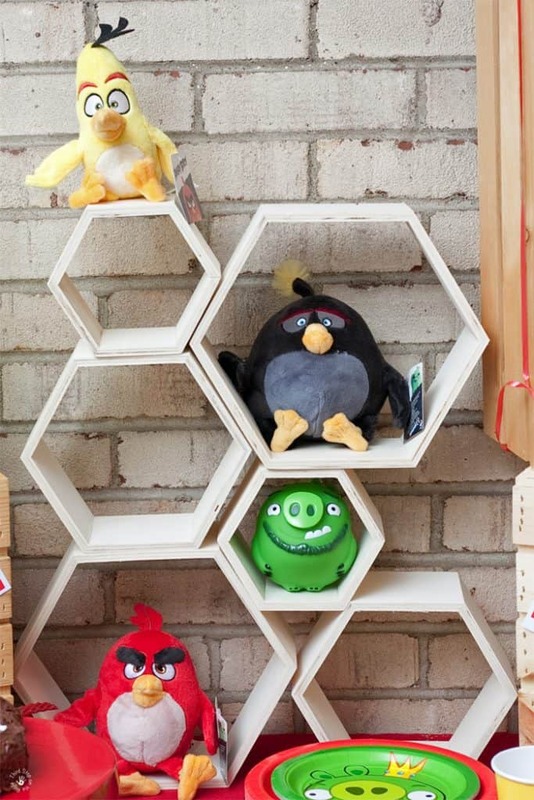 The one I made is actually created with wall accents and decorated with some plus Angry Bird characters. I used some wooden crates that I picked up at Walmart to create dynamite crates. 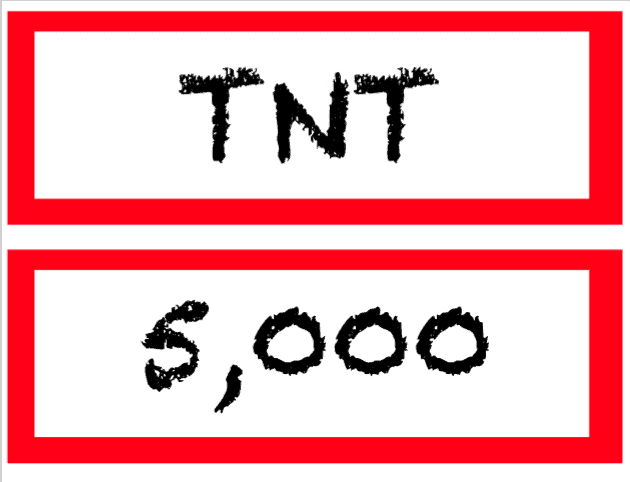 I labeled them with signs that said TNT and also one that said “5,000” for points. When it came to food I got creative. I iced cupcakes to correspond with the colors of the three main characters, Red, Chuck, and Bomb. I topped the cupcakes with some small action figures. 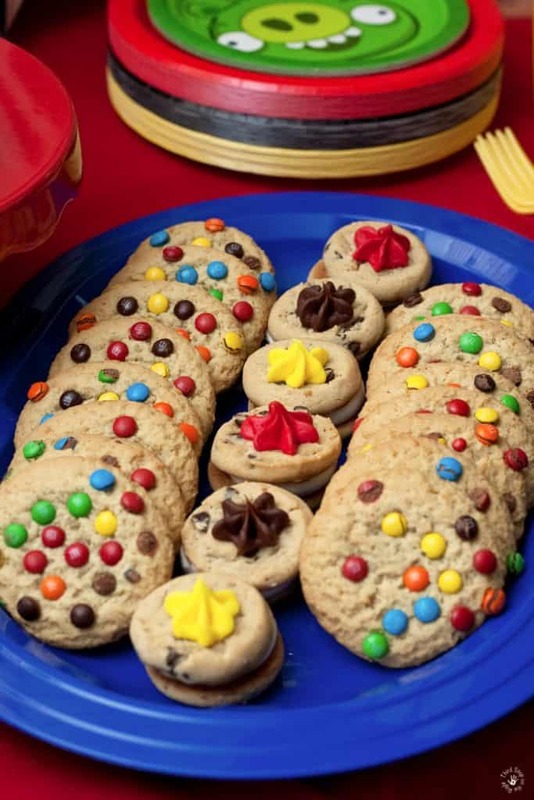 I also made a cookie tray with cookies that corresponded with the birds’ colors. What is an invasion of Piggy Island without a bomb? I made a small 6-inch cake and iced it with chocolate icing. I added a small cupcake and a stick of licorice as the bomb fuse. 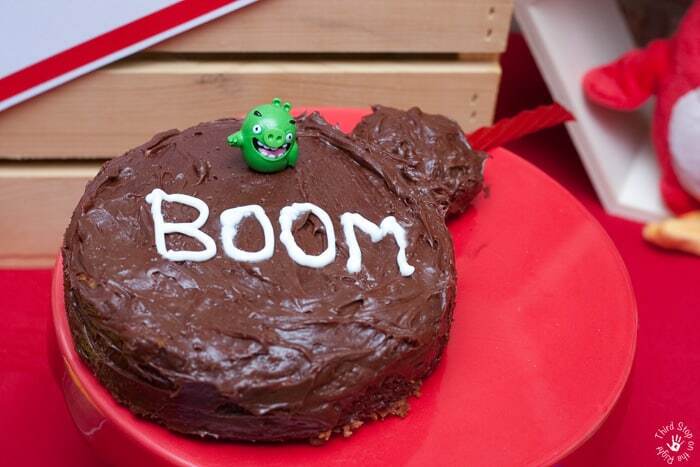 I wrote “BOOM” on the cake and added a pig figure. 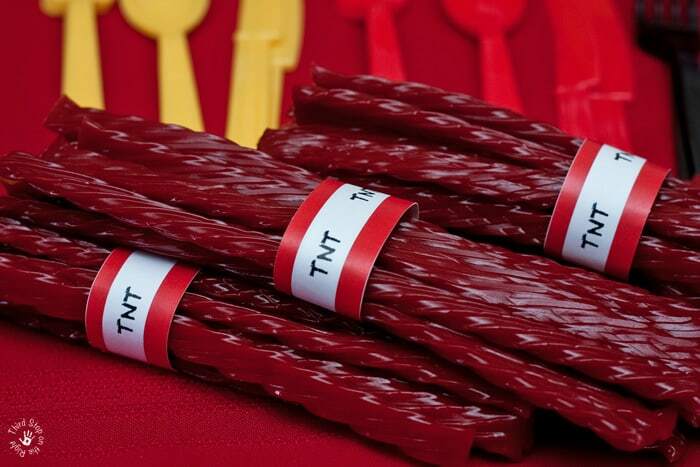 I also added some dynamite stick licorice. 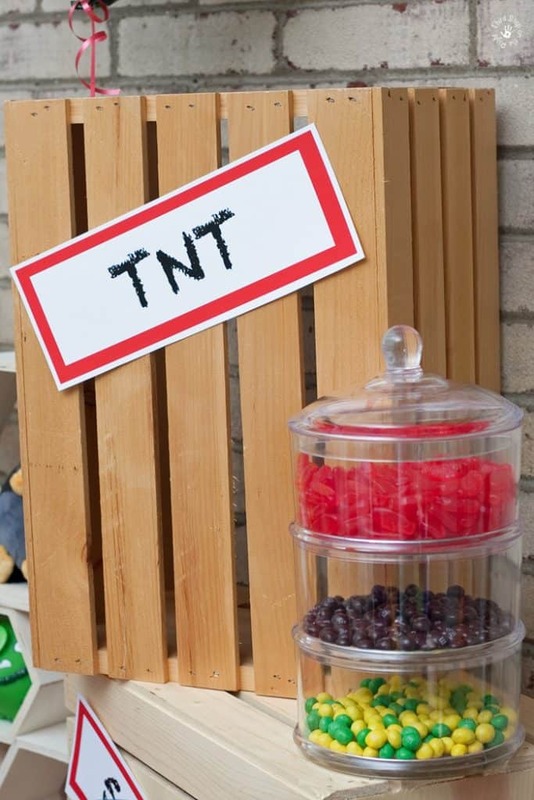 I took a bunch of about 10 red licorice sticks and put a wrapper around them that said “TNT” and placed them on the table. 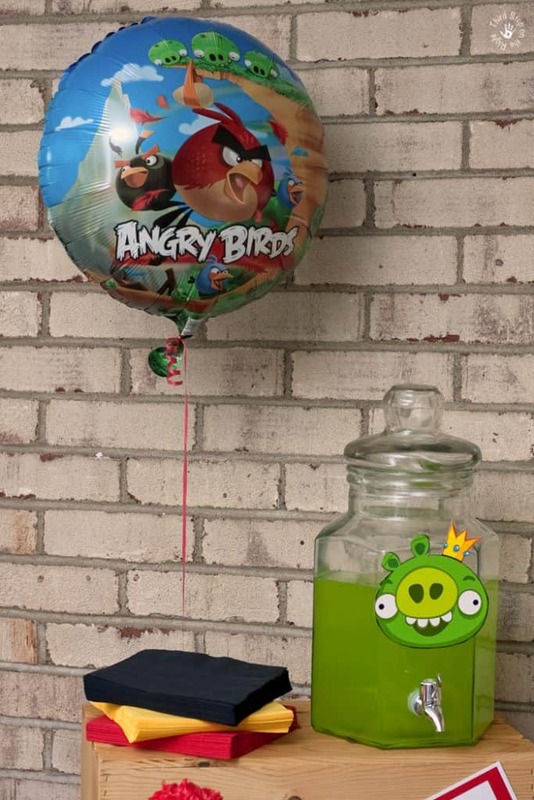 For drinks, I created some Angry Bird cups and filled my drink dispenser with green punch. I cut out the picture of the pig king from one of the plates and attached it to the dispenser. I embellished the table with some other items that corresponded to the birds and their colors such as candy, plates, and other tableware. 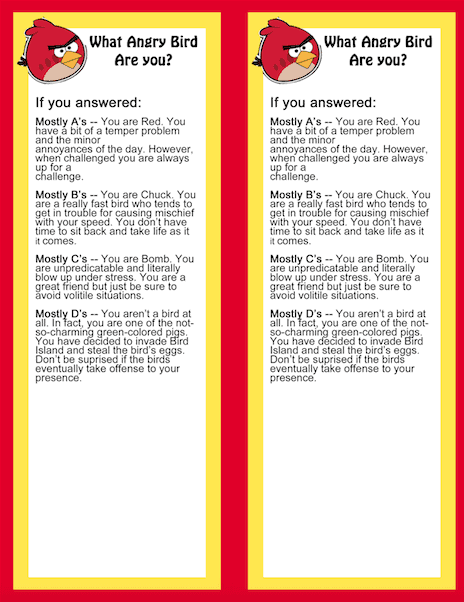 I created some “Which Angry Bird Are You” printables. 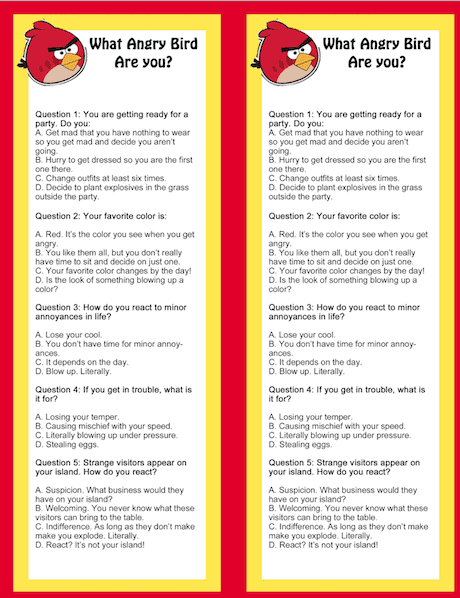 These are fun personality quizzes which are based on the movie characters. 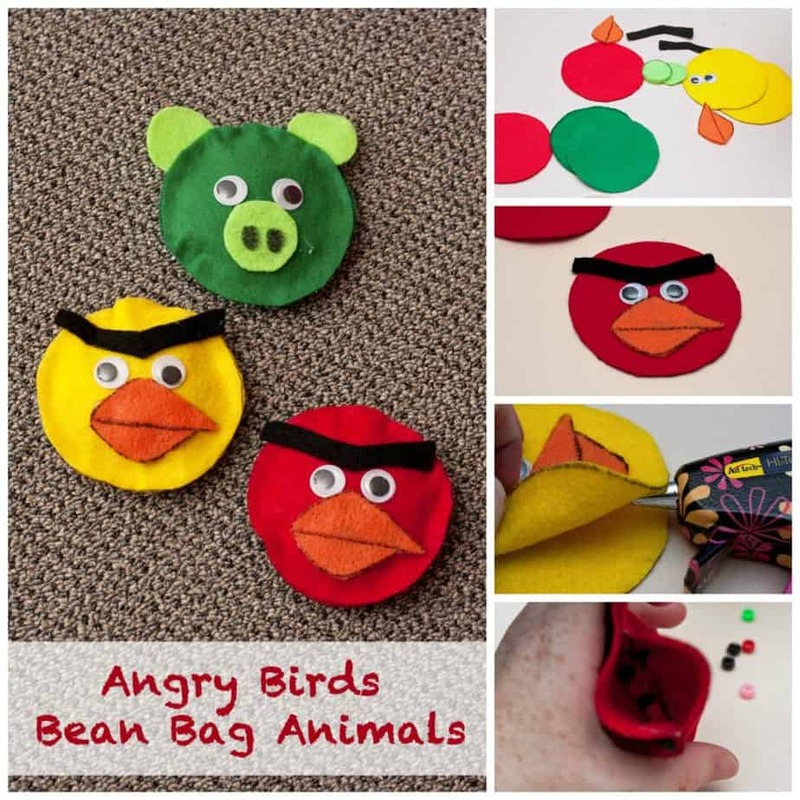 I also wanted the kids to be able to do a small craft so we made Angry Bird beanbags. Before the party I cut out pieces of felt which would make the body and the face of the bean bag critters. I had the kids place the pieces of felt onto the body and I hot glued it together. I then used some small pony beads to fill the bean bag. The kids loved picking and creating their favorite character from the movie! I became familiar with VUDU through Walmart Family Mobile. I have the Walmart Family Mobile Plus Plan which features 10 GB of 4G LTE data as well as unlimited talk and text for only $49.88 per month. The Plus Plan also gives you a free VUDU movie each month ($7 value) which is perfect for watching on your SmartTV, Chromecast, or even Roku. Plus, Walmart Family Mobile features fun, trendy, and affordable phones such as the Coolpad Catalyst which is only $59.88. 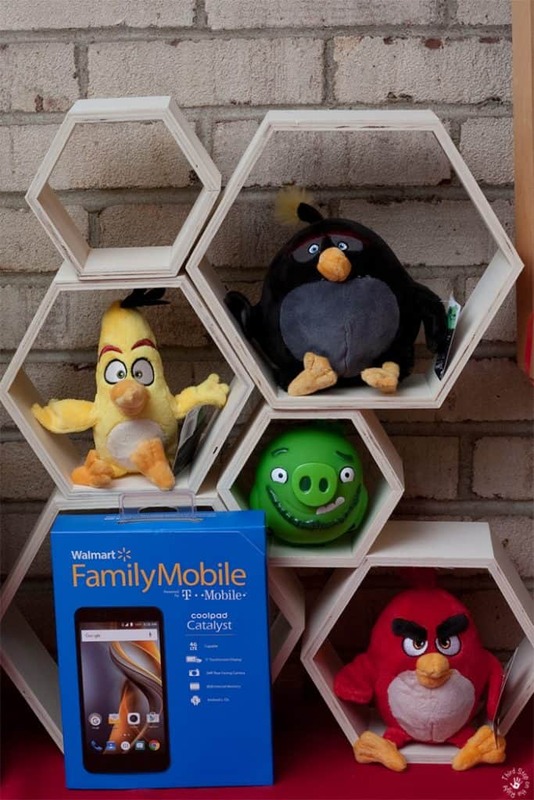 Signing up with Walmart Family Mobile is easy and there are no contracts! All you have to do is go to Walmart, choose your plan, your phone, and the starter kit which is $19.88 (on Rollback from $25!) and you are ready to go. 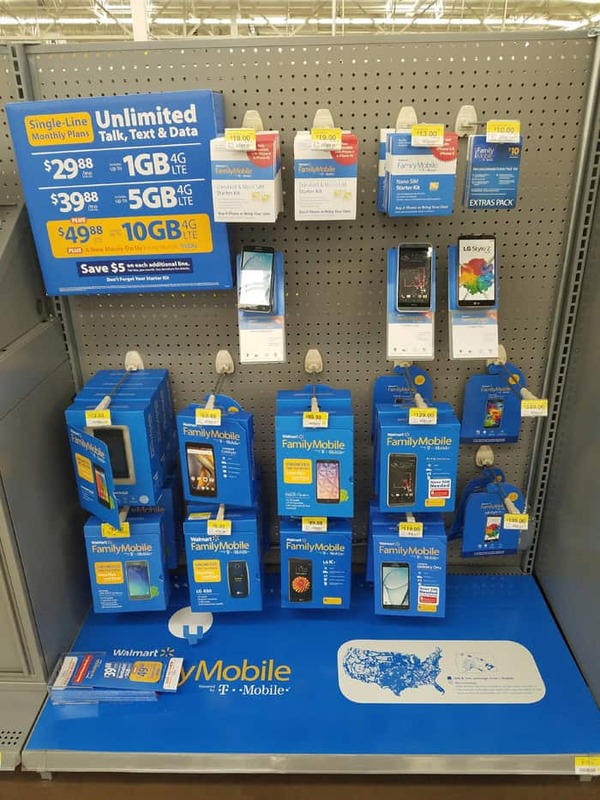 In addition, you can check out the Walmart Family Mobile in-store events to find out more about the Walmart Family Mobile plans. 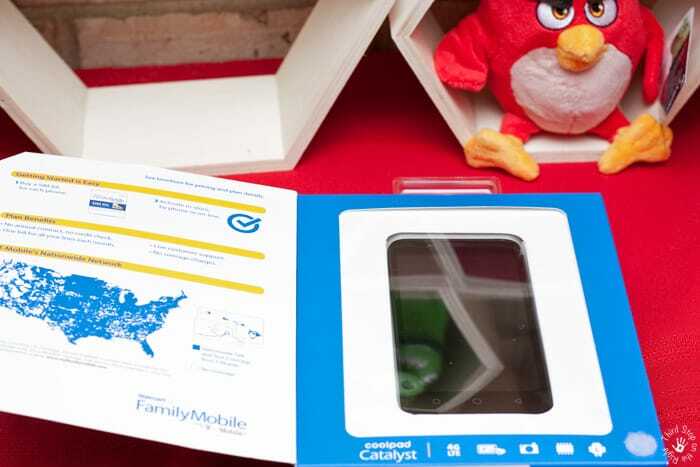 A Walmart Family Mobile rep will be there to answer questions and will have code that you can scan to receive a free power up for the Endless Runner Game on the Angry Birds Action! app. Check out this website to find the in-store event closest to you. 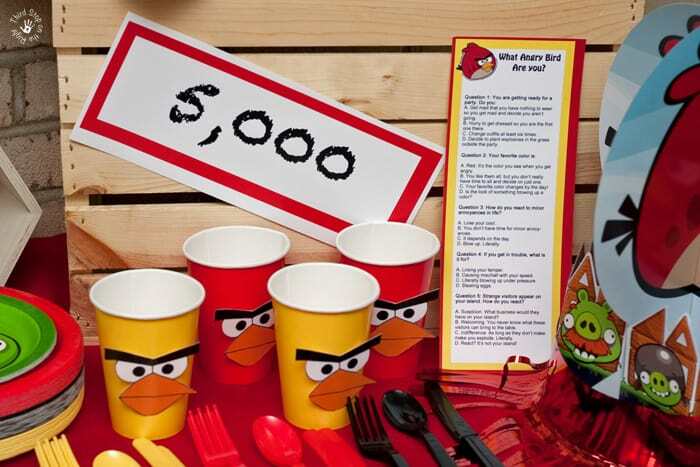 Plus, be sure to keep your eye out for the Angry Birds display. You can scan the Angry Birds code on the displays to unlock a selfie augmented reality experience with the Hatchlings. This was such a fun party to not only design but also to participate in! 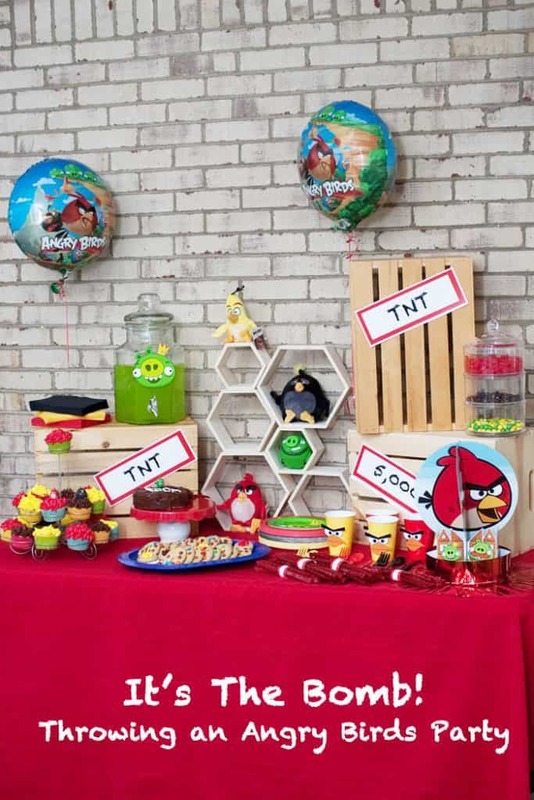 To help you to create your own Angry Birds viewing party, be sure to check out some of the downloadable printables I created. 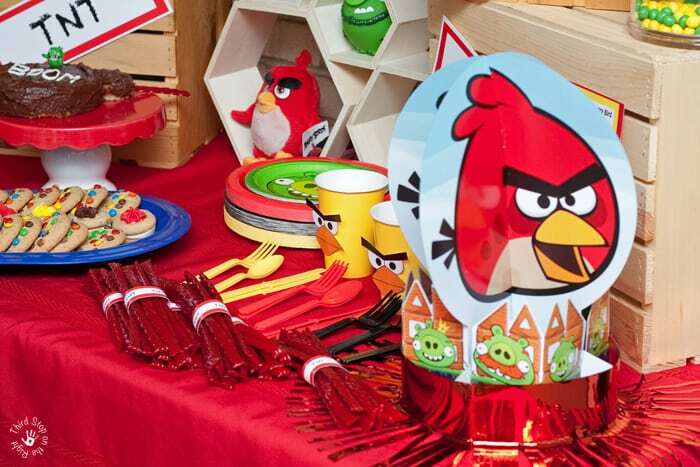 Comment On: What was your favorite part of my Angry Birds viewing party?